*‘The average age of the menopause in the UK is 51 years. However, many women have an earlier menopause’ and the perimenopause (the time leading up to the menopause where symptoms occur due to fluctuating hormones) can start years before your period stops. Take your hands away from your eyes. Ignorance is definitely not bliss. Any women unlucky enough to have been kept in the dark about periods sure had a rude awakening when they suddenly thought they were bleeding to death - from down there! Educating ourselves about the menopause has to be a good thing so we have an idea of what potential symptoms lie ahead, empowering ourselves with knowledge on coping strategies and available remedies to help ourselves, and support others. West Midlands Association for Women in Policing (WMAWP) - ‘A network to encourage & enable women to make their full contribution to policing’ identified the menopause as a workplace issue after their research discovered many women were suffering in silence and did not feel that this was a subject that could be confidently discussed in the workplace without fear of judgement or ridicule. In 2016 WMAWP asked Laughology to devise a workshop about the menopause to which male and female staff across all levels were to be invited with the main aim of getting people to talk about it - debunking some myths along the way, and sharing facts and personal experiences. Laughology were the perfect fit for this role as our expertise is in combining science and humour to provide knowledge in a fun learning environment without ridiculing or belittling. Four workshops were spread over two days in September 2016 and were well attended by both genders. The use of humour from the word go really helped people relax and open up around what had been previously considered a taboo subject. The menopause is a mental health issue. Some symptoms you might have already heard of may be hot flushes, night sweats and mood swings. One woman told us her male boss was very supportive and that together they had come up with a code word for when she experienced menstrual flooding so that she could go and get changed with minimal fuss. A simple, practical solution. Interestingly, some shared experiences of female bosses who were unsupportive as they had either not experienced the menopause themselves, or had been fortunate enough not to have had many symptoms and therefore didn’t see the menopause as a big deal. 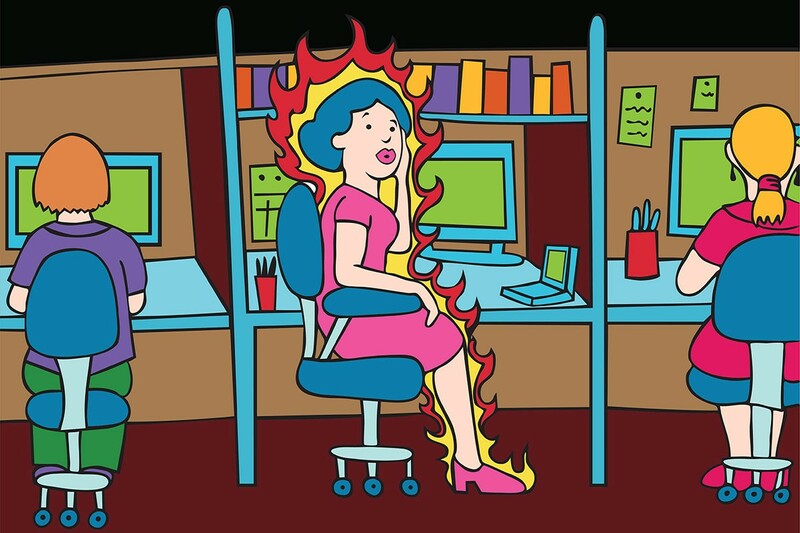 The menopause can affect wellbeing, productivity and absenteeism. Signpost staff to helpful websites and display leaflets in common areas (rather than female toilets) Have a menopause meeting – talk about it! Have fun with it. One of the websites referred to in this blog is that of Dr Louise Newson – the ‘menopause doctor’*. She is infectiously passionate about educating people on the menopause and loved the Laughology workshops. Dr Newson is a menopause expert (of which there needs to be more), and featured in the ITV program ‘The Truth about the menopause’ which aired in November 2016. Many women are either ignored or misadvised by their GPs. If your symptoms (or those of someone close to you) are affecting your daily life keep seeking advice until someone listens. The menopause affects us ALL. Yes that includes you. Let’s talk about it. Let’s laugh about it. Let’s do something about it.